Johnston County Hams of Smithfield, N.C., is recalling approximately 89,096 pounds of ready-to-eat hams. 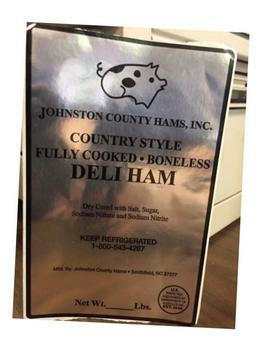 An investigation by the Agriculture Department's Food Safety and Inspection Service determined that four people infected with the outbreak strain of Listeria monocytogenes in North Carolina and Virginia were linked to ready-to-eat deli ham produced by Johnston County Hams. All ill people were hospitalized. One death has been reported from Virginia. The recalled products, bearing establishment number “EST. M2646” inside the USDA mark of inspection, were shipped to distributors in Maryland, North Carolina, New York, South Carolina and Virginia. Consumers with questions regarding the recall may contact Rufus Brown at (919) 934-8054.